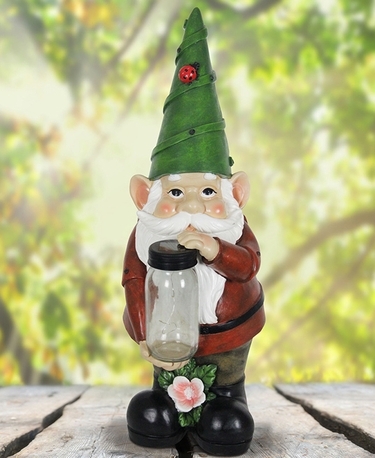 Standing an impressive 28 inches tall, this Solar Gnome Holding a Firefly Lantern is sure to capture your heart and your imagination! A string of solar powered LED lights will illuminate in the jar at dusk bringing this garden art to life. Made of Durable Resin for All Seasons! Size: 12" x 9.75" x 28.5"H.